The City Museum is continuing its Historiography program in July, a non-fiction book reading group held in collaboration with the West Chicago Public Library. On Thursday, November 15 at 1pm the group will meet to discuss Sin in the Second City by Karen Abbott. The book group is open to all, feel free to bring a bag lunch; complimentary drinks and desserts will be provided. Copies of the books being discussed can be checked out from the Museum or Library while available, limited copies available. Guests are also invited to come and discuss the topic, even if they have not read the book. Chicks and Ducks and Bunnies, Oh My! The City Museum is continuing its Historiography program in July, a non-fiction book reading group held in collaboration with the West Chicago Public Library. On Thursday, November 15 at 1pm the group will meet to discuss Da Vinci by Walter Isaacson. The book group is open to all, feel free to bring a bag lunch; complimentary drinks and desserts will be provided. Copies of the books being discussed can be checked out from the Museum or Library while available, limited copies available. Guests are also invited to come and discuss the topic, even if they have not read the book. Free, all ages. Drop in to try your hand at drawing an item from the Museum’s collection during “Drawing on History” and view our current exhibits. Free, all ages. Drop in to make a historically inspired Valentine and view our current exhibits: West Chicago POP! and Building Community. The City Museum is continuing its Historiography program in July, a non-fiction book reading group held in collaboration with the West Chicago Public Library. On Thursday, November 15 at 1pm the group will meet to discuss Sharp by Michelle Dean. The book group is open to all, feel free to bring a bag lunch; complimentary drinks and desserts will be provided. Copies of the books being discussed can be checked out from the Museum or Library while available, limited copies available. Guests are also invited to come and discuss the topic, even if they have not read the book. The City Museum is continuing its Historiography program in July, a non-fiction book reading group held in collaboration with the West Chicago Public Library. 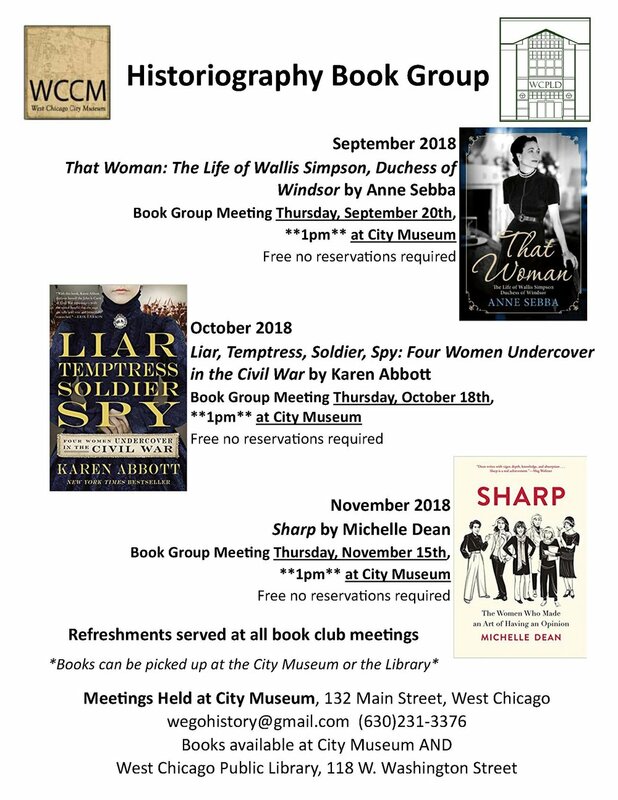 On Thursday, October 18 at 1pm the group will meet to discuss Liar, Temptress, Solider, Spy: Four Women Undercover in the Civil War by Karen Abbott.The book group is open to all, feel free to bring a bag lunch; complimentary drinks and desserts will be provided. Copies of the books being discussed can be checked out from the Museum or Library while available, limited copies available. Guests are also invited to come and discuss the topic, even if they have not read the book. On Friday, October 5th, the City Museum will present the 29th annual Tales Tombstones Tell at Oakwood Cemetery, located at York Street and Oakwood Avenue. Tours begin at 6:30 pm and start off every 10 minutes thereafter, with the last tour starting at 7:30 pm. Tours last approximately 45 minutes and no reservations are necessary. If the weather is inclement the program is cancelled. Guests will be entertained by historic music from Roger Kotecki as they wait to start to the tour. The program is appropriate for families and is based on our community’s history. This year we will feature James Mulligan, David Springer, Mary Kaiser, Clara Church, Clinton Beach, Barbara Hahn, and Walter McAuley and explore how the health field impacted their lives and deaths. Come join us for this impactful evening stroll, with lanterns and luminaries lighting the path through West Chicago’s oldest cemetery. Although the program is free, donations are appreciated. For more information please call the Museum at (630) 231-3376 or email us at museum@westchicago.org. The City Museum is continuing its Historiography program in July, a non-fiction book reading group held in collaboration with the West Chicago Public Library. On Thursday, September 20 at 1pm the group will meet to discuss That Woman: The Life of Wallis Simpson, Duchess of Windsor by Anne Sebba. The book group is open to all, feel free to bring a bag lunch; complimentary drinks and desserts will be provided. Copies of the books being discussed can be checked out from the Museum or Library while available, limited copies available. Guests are also invited to come and discuss the topic, even if they have not read the book. The City Museum is continuing its Historiography program in July, a non-fiction book reading group held in collaboration with the West Chicago Public Library. On Thursday, July19th at 1pm the group will meet to discuss the "WWI 100th Anniversary Collection." The book group is open to all, feel free to bring a bag lunch; complimentary drinks and desserts will be provided. Copies of the books being discussed can be checked out from the Museum or Library while available, limited copies available. Guests are also invited to come and discuss the topic, even if they have not read the book. Historiography Non-Fiction Book Club: July "World War I"
Here’s the Scoop: The Library and the West Chicago City Museum are celebrating summer with an ice cream social. Join us for a fun-filled afternoon the whole family can enjoy complete with games, learning how to make your own ice cream, crafts, a tour of the old Chicago, Burlington & Quincy train depot built in the 1860s, and - of course - building the most amazing ice cream sundae ever! So, bring your family and your picnic blanket and head on over to the library. Don’t let this special event just pass you by! Be prepared to be whisked away on a literary adventure! Join West Chicago Library and the West Chicago City Museum once a month as we team up for a story-time experience. We will look, listen, create, explore and play. Ms. Kelli from the Library will be reading stories linked to the City Museum’s collection. Afterwards we will have some fun with a variety of hands-on activities. This program is FREE of charge and requires no registration. Meet us on the second floor of the City Museum. Stop by the Museum during our special Late Night open hours. Late Nights are held in conjuction with Gallery 200's opening receptions for special exhibits. The City Museum is continuing its Historiography program in March, a non-fiction book reading group held in collaboration with the West Chicago Public Library. 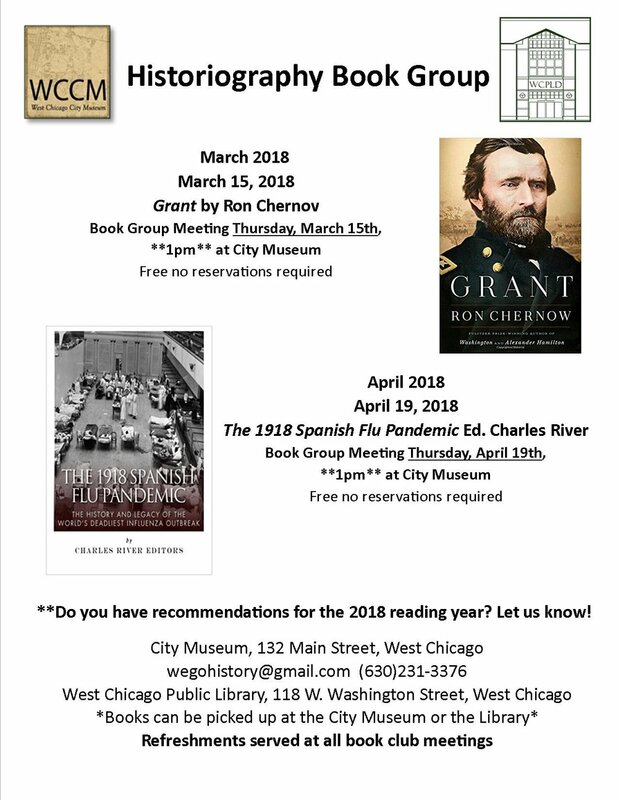 On Thursday, March 15th at 1pm the group will meet to discuss “Grant” by Ron Chernow. The book group is open to all, feel free to bring a bag lunch; complimentary drinks and desserts will be provided. Copies of the books being discussed can be checked out from the Museum or Library while available, limited copies available. Be prepared to be whisked away on a literary adventure! Join the Library and the West Chicago City Museum once a month as we team up for a story-time experience. We will look, listen, create, explore and play. Ms. Kelli from the Library will be reading stories linked to the City Museum’s collection. Afterwards we will have some fun with a variety of hands-on activities. This program is FREE of charge and requires no registration. Meet us on the second floor of the City Museum. Get active with history by participating in the Turner Junction Challenge, which kicks off on May 20, 2017. First: register (for free) at the City Museum or through the form at the link below. Then: track any physical activity that gets you moving. Minutes spent moving will translate into time-travel, with the goal of making it all the way back to 1849. For each 15 minutes of activity, participants travel back in time one year. Make it back to 1849 by September 10, 2017! You can do this by spending just three hours of time on physical activity every week. The 2017 Turner Junction Challenge theme is The History of Fires. “Turner Burners” will uncover the history of the fires in town as you travel back in time. Additional bonus time can be received by visiting the Museum’s CB&Q Depot during open Saturdays for Burner Challenges. More details to come! All participants will receive a free water bottle at registration and receive prizes for reaching milestones in West Chicago history. If you make it back to 1849, you receive a Turner Junction Challenge t-shirt! Participation is free and open to all. Families are also welcomed to sign up as a group or as individuals.